World Football Commentaries: Marcelo Bielsa: "My football is emotion. There isn't only money." Marcelo Bielsa: "My football is emotion. There isn't only money." Marcelo "El Loco" Bielsa, the new manager of Lille in Ligue 1, gave a rare public lecture at the Teatro della Sapienza in Perugia, Italy. The discussion was attended by an Italian journalist, Iacopo Iandiorio, of La Gazzetta dello Sport. 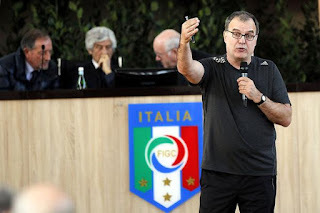 Mr. Bielsa touched not only on football themes but societal ones in a provocative presentation. With increasing scrutiny on French football due to Neymar, Jr.'s transfer to PSG, Bielsa's commentary takes on an even more important role. 1. A Master's level lecture. 5. Tactics: His 50,000 Games. 6. On the origin of his nickname, El Loco. Marcelo Bielsa during his March 2015 presentation. "Football is about breaking an opponent down one by one (gambeta), it's dribbling, which is its highest and best technical gesture. You can't teach or modify it. However, if you don't do more than just dribbling, I must think how to get around and overcome your rival." "Football is the first topic of conversation in the world. And it has something quite unique: That at times, you even win when you are the underdog, or worse, before the game. This makes one have roots in a very strong way in the most popular segments of society. And for me, the fan base (l’hincha,) has no substitute, and provides strong emotional messages. Wins or losses leave an emotional imprint on them. On Monday, a fan shows signs (in his daily life) about what happened on Sunday." 1. The translation of the Argentinean Spanish concept of gambeta was courtesy of Juan Arango of Beyond The Pitch. 2. Hincha is the Argentinean Spanish word for a team's fan base. "I lived in Mexico and knew a Basque who had been exiled. The exile alienated him from his surroundings and was very painful. In other words, he was a specialist in suffering. I asked him what is the most important thing for a man? 'To be loved without conditions,' he told me. A fan is the same way: He loves you in exchange for nothing. There is a phrase I read in Seville and I had a lot of problems initially to understand it: I love you even if you win. That is the rejection to be compensated (for a victory) to augment the significance of the affectionate bond. Consequently, not even a win is important, I love you in exchange for nothing." "The industry that today is football has forgotten the fan. They throw around financial figures that should make them blush with shame." Singing a tango to his Lille players in an uncharacteristic moment for Bielsa. "Emotion: That is precisely what a fan demonstrates. I will try once again to arise strong emotions in my footballers. Because if players have the responsibility to make others feel emotions, well, they too must show strong emotions. It's a paradox but it's like this: To be top professionals, they must experience the spirit of amateurs. They have to know how to get emotional again." 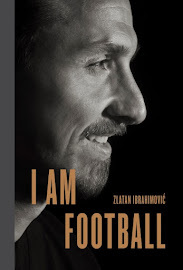 "The South American footballer, and his manager, are more tied to the 'creative' moment, to dribbling, as I was saying before. Their European counterparts instead think more about the collective. Where you defend against the weakest link of the team. Here is why I like to manage in Europe. Even if Italian football in recent years has hit rock bottom while the German equivalent has grown, Calcio knew how to build and develop talent. "The best is the one who arrives higher but not in an absolute sense considering where he started out from. Because the best one in departure doesn't have merits. He inherited everything from his genetics. In football, I claim the passion to develop their actual qualities. And to the best one, we give privileges. Instead, we ought to give him additional obligations, because privileges provoke individualism. But if a team is united, it doesn't mean that it will surely win. Because it's certain if a team is not united, you don't win." "The social example tells us the contrary: That the poor or weak are annoying. Therefore, to educate, is a difficult process. In society, one speaks about rejecting migrants, of those who are different, of those of color, or of Muslims. But what really causes fear is poverty. Because if a foreigner has petrodollars or is a rich Chinese, he doesn't create any problems or fears." "Even in the actual football (of today), a weakling is stigmatized, and they beat him up. I, on the other hand, think that justice is not to give everyone equal treatment but rather should be based upon necessity. And not to ask everyone for the same effort but based upon their capacities." With three men at the back: 3-3-1-3 (which was his first formation), 3-4-3, 3-4-1-2, 3-3-4 and 3-3-2-2 (very unusual)". "The nickname was derived from when I began to coach in the youth ranks at Newell's Old Boys. Usually, each manager had three teams in three different categories. I asked to only manage one so I could dedicate myself to it completely. I was the first to arrive at work and always the last one to leave. Because then I was already very obsessive, I studied a lot, and took in every minute detail. So, my colleagues began to call me El Loco, the crazy one, but in a very affectionate way. Well, if you call me that, I'm not sorry. If it's instead used to play a joke on me, no." "My model was Louis van Gaal. The motion picture film that I liked the best, and I devour cinema, is The Godfather. Managers? I like Julian Nagelsmann. Jorge Sampaoli is better than I in terms of flexibility and he doesn't fall in love with his own ideas. Even if you have to, a little, to convince others." Bielsa: "Il calcio è emozione, non denaro"; La Gazzetta dello Sport; 17 maggio 2017; Iacopo Iandiorio.